Are you managing a change effort that has run into passive resistance or active sabotage? Or are you afraid that might happen? Maybe you're beginning to wonder if your career is on the line. Here's a new look at approaches the best change leaders use to inspire and lead the people of their organizations to a new way of working. 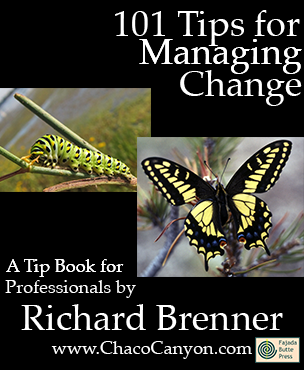 This book is a great way to learn from the experience of others with a direct focus on what you need to manage an effective change effort. Hiring a consultant might give you someone to blame, but blaming someone else might not be protection enough. The best protection is success. Here's a new look at approaches that the best change leaders use to inspire and lead the people of their organizations to new ways of working. Change managers everywhere face similar challenges, no matter what the size of their organizations. And there's plenty of help available, though much of it is either too abstract or very cook-booky. We need a way to learn from the experience of others without having to read a 200-page book full of theory and evidence. People who ordered this item also ordered 101 Tips for Managing Conflict.Management's need to project an image of stability and control can sometimes manifest itself as a desire to position all Change efforts as elective, even when they're forced upon the organization by competitive or threatening factors external to the organization. Because positioning Change efforts as elective when they are not fools no one, you can avoid stimulating resistance and cynicism by being honest about whether the change effort is elective or not. 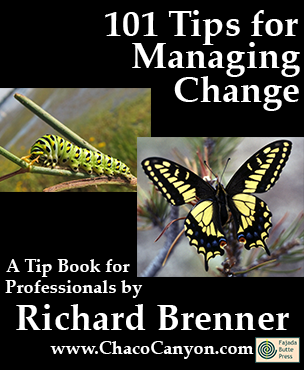 Make a change in how you manage change — order this tip book now! Think "us" not just "me"
101 Tips for Managing Change is in Acrobat format, which gives you several advantages. You can print it, and read it like any book. Or in electronic form, you can use the search capability of Adobe Reader to find passages of special interest to you. If you load it onto your laptop, tablet, or other mobile device, you can read it anywhere — and it's weightless, too. 17 pages.